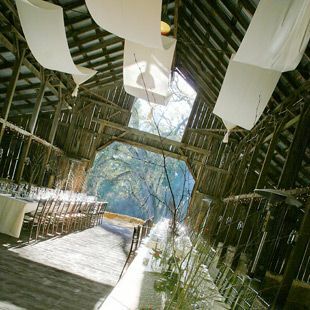 The great thing about holding a wedding reception in a barn is the fact that you’re a barn. These old beautiful structures have such incredible character that you barely have to do anything to them. However one question I’ve been asked is what do you do to the ceiling. My answer is usually along the lines of what is represented in this photo. A simple run of fabric that matches your table cloth works really well.